Get ready for the annual summer festival of the year – Dead Rocks! Headlined by Zeds Dead, on Monday 2nd July 2018 they’ll be supported by the incredible Dillon Francis and Paper Diamond!! Prepare for an unforgettable night at the Red Rocks Amphitheater – tickets selling out FAST, so don’t delay!! Get yours now while you still can! Formed in Toronto, Canada, Zed’s Dead consists of songwriter/producers Dylan Mamid (DC), and Zachary Rapp-Rovan (Hooks). Starting off with a mutual love of hip-hop under the name Mass Productions, they released their first hip-hop EP in 2007. Later, they took more of an interest in EDM, took the name Zeds Dead from a line in the Quentin Tarantino film “Pulp Fiction,” and began to gather an audience on MySpace. This led to a series of live performances and the weekly party night “Bassentimentality,” where the duo performed regularly and had new DJ’s playing every week. Throughout the four years that the night was active, Zeds Dead hosted early performances from acts that are huge now, including Skrillex and Bognore! In 2009, they began their first official North American tour, toured Europe, and then toured the US again. Now, they have a massive worldwide following, and in 2016, founded their own record label, Deadbeats! Always on the lookout for and supporting their fellow acts, Zeds Dead’s annual Red Rocks event is one of the most highly anticipated in electronic dance music. What are you waiting for?? 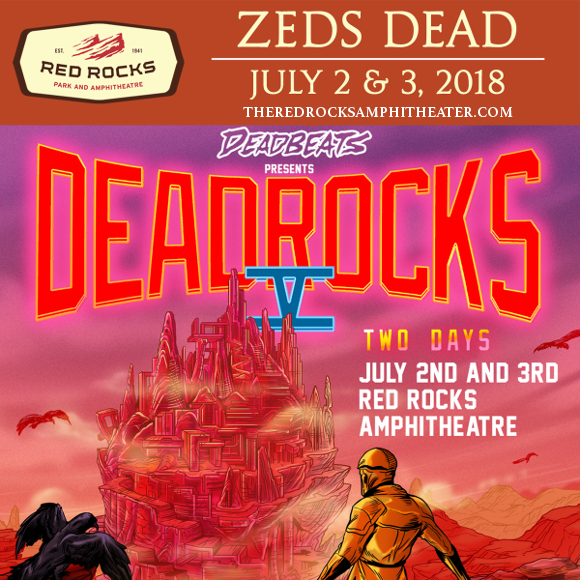 Get your tickets to Deadrocks today! !